Specialty Services - Premier Corrosion Protection Services, Inc.
Trash Rack / Log Rack Fabrication and Coating - Fabrication of 16' wide x 22'-6" long metal trash rack coated with a Fuji Film fouling release system. 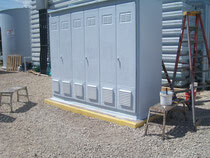 Electrical Enclosures - Repairs to various metal electrical enclosures. 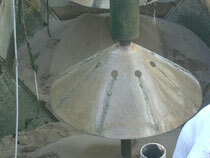 Dust Collerctor, Exterior - Repair to the exterior of a metal dust collector with FRP. Tanker Trucks - Coating the interior of tanker trailers. 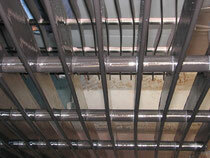 Trash Rack Coating - Coating of trash racks / log racks for various power generation facilities with a fouling release system. 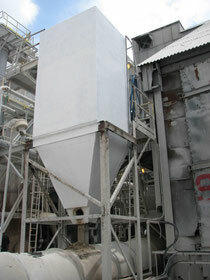 Dairy - Repairs to concrete and coating of facility for protection against lactid acid. Aerospace - Coating of 10,500 square feet of epoxy flooring at a aerospace facility. Tank Oveflow Pipe - Replace damaged and clogged tank overflow pipe. 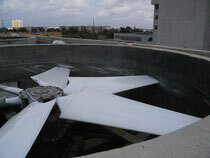 Cooling Tower Fan Blades - Repairs and coating of various cooling tower fan blades. 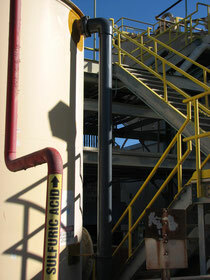 WWTP Sand Filters - Manufacture and install components for a sand filter at a water treatment facility. 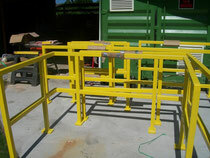 FRP Handrails - Manufacture and install FRP handrails as replacement for damaged metal handrails.